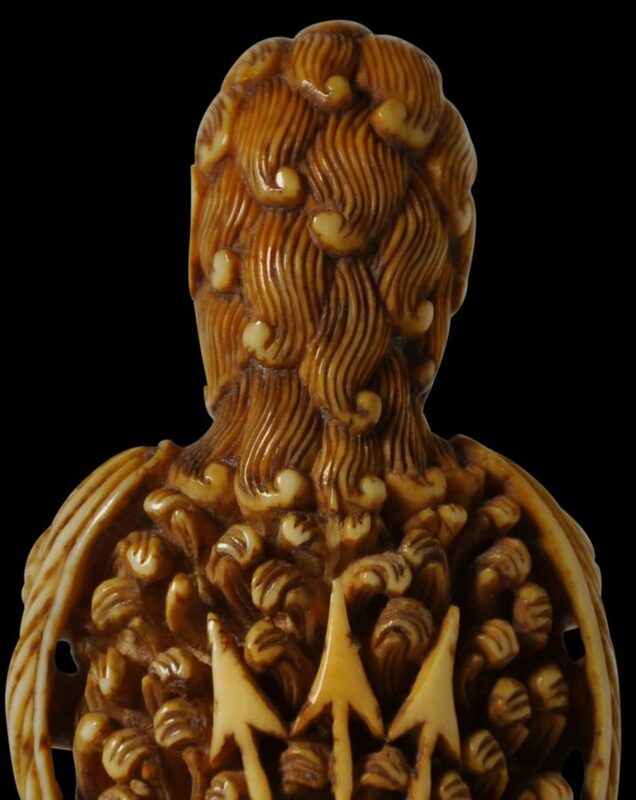 This is the best carved ivory kris handle from Madura we have seen, published or otherwise, (Madura is an island off the east coast of Java). It is extremely finely carved, the motifs are very unusual, and the condition is perfect. It also has a glossy, warm, honey patina. The handle is an extraordinary and eclectic concoction of Christian, Dutch and even Ottoman motifs demonstrating the relative openness of Indonesia’s craftsmen to outside influences brought to the region by colonialists, trade and even missionaries. The handle is carved as a European woman with long, pulled-back hair. She has angel or seraphim figures on either shoulder, each with a long wing that falls down her shoulder. She holds between two thin arms and against her bosom a large version of the Dutch crown. The crown sits over a small niche that has been carved with a lion’s head. This rests on a leafy platform and between two stocky Java ponies. The back of the handle is deeply carved with the fine, flowing locks of the female figure, then a wide area of leafy flourishes in high relief in which a quiver and arrows are carved. These are arrayed in the style seen on Ottoman silver, a motif also employed over the Kori Kamandungan entrances in the Kraton in Surakarta (Solo), central Java. Long locks of her hair fall between this motifs and the tails of the Java ponies. 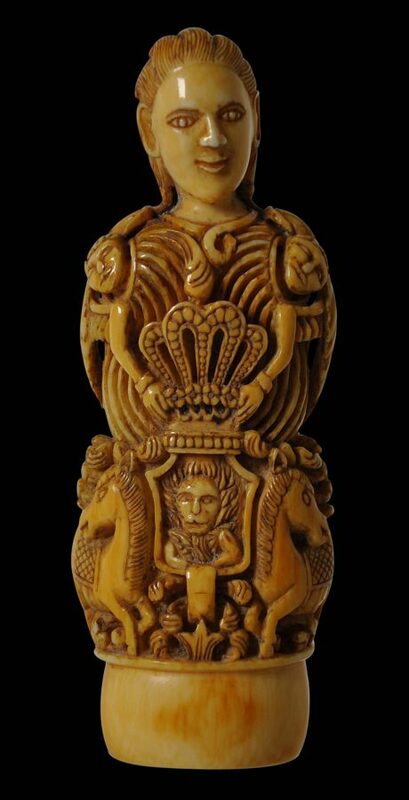 The female figure with the seraphim faces on either side looks remarkably like many of the Christian ivories of the Madonna and child carved in Goa, the Philippines and even southern China, (see Pal, 1988, p. 239 for an example.) It is possible or even likely that the carver based his work on such a carving, despite Madura being overwhelmingly Muslim (although there is a significant Catholic population in nearby central Java). The Dutch crown is of a form typically reproduced on Madura and Bali – in carved ivory hilts, jewellery, and even on the facades of Balinese Hindu temples. See Greffioz (2006) for a kris hilt that shares some of the characteristics of the hilt here but which is a much later copy. Overall, this is an excellent and very rare hilt in excellent condition. 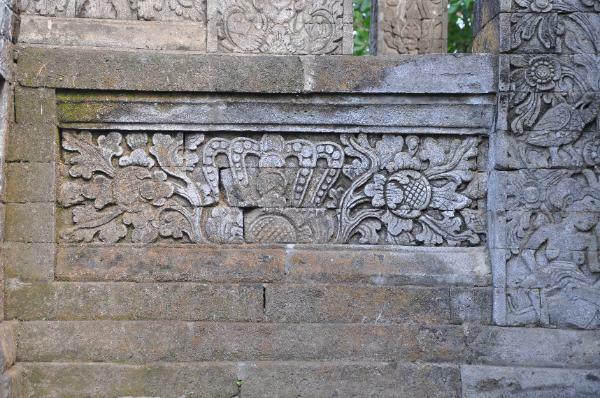 A carved stone panel at the Maduwe Karang Temple, northern Bali, which incorporates the Dutch crown motif. Greffioz, J., The Kris: A Passion from Indonesia, 2006. Marzio, F., The Glassell Collections of the Museum of Fine Arts, Houston: Masterworks of Pre-Columbian, Indonesian, and African Gold, The Museum of Fine Arts, Houston, 2011. Mutholi’in, A., et al, Karaton Surakarta: A Look into the Court of Surakarta Hadiningrat, Central Java, Marshall Cavendish Editions, 2006.